The current head-wear of choice at cSPACE these days is hard hats as we begin our construction activity at the King Edward. 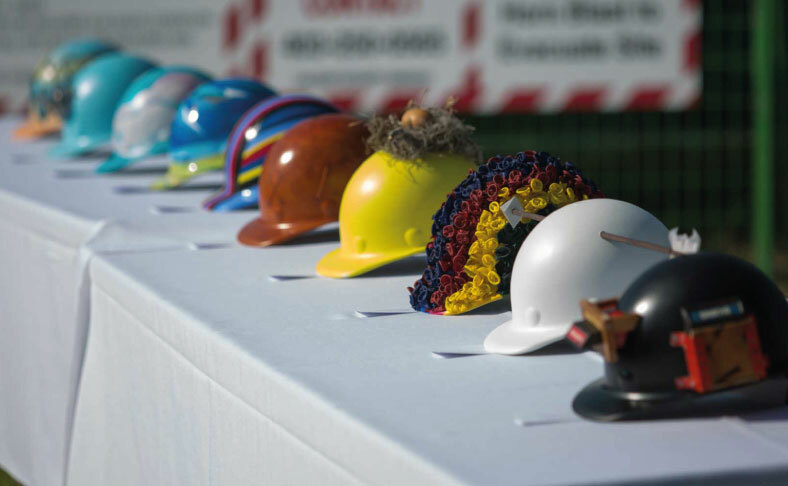 For one special day in May, utilitarian hard hats became colourful and ingenious canvases for 25 works of art at our groundbreaking ceremony. We invited a dozen local artists – many who we have collaborated with us in the past – to create unique pieces to thank community champions and partners for their support. 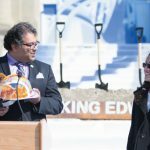 Hard hats were adorned with everything from a bird’s nest (Katie Green), to arrows (EarthFolk), geodesic domes (Morgan Free), and teddy bears (daniel j.kirk). Many of the artists had past connections to either the historic school , and while the King Edward is not yet open, we still endeavor to support the artistic community as we wait patiently (and for not much longer!) for the building to open. Jesse Gouchey’s 4 hard hats featured graffiti and animal themes, heralding from his Cree-Metis heritage. Hard hats were not his first taste of making art at the King Edward. As the award-winning animator of “Spirit of the Bluebird”, Jesse was provided a temporary space in the building to create a segment of his newest painted, stop-motion animation. The work releases in the fall of 2015, and we’re excited to keep an eye out for it! Verna Vogel, a local painter and creator of 3 hats for the ceremony has had a varied connection to the King Edward, from displaying art during one of cSPACE’s first open houses, to a draw-til-you-drop event by Mark Vasquez-Mackay (another creator friend of ours), and exploring a camera obscura at the school before it was brought to Beakerhead in 2104. Verna’s hard hat creations bring her to the King Edward one more time with the lovely Healer’s, Instrumentalist’s, and Miner’s Hats. Hard hats by Verna Vogel Left to Right: “Healer’s Hat”, “Instrumentalist’s Hat”, & “Miner’s Hat”. PHANTOM WING, a 2013 art show by the collective Wreck City (who’s newest collaboration DEMO TAPE launches in June) commemorated the soon-to-be demolished 1960’s edition to the school, and made many community connections to the King Edward. Lane Shordee, a scavenger artist who “drawing from construction waste and items found by happenstance, builds elegant sculptures and installations that both challenge and indulge our relationships with the things we throw away,” was one such connection. During PHANTOM WING, Lane helped create a collaborative installation called “Waterways”. The piece was created in response to Calgary’s floods, using reused and repurposed flood debris to create a water-based public sculpture. Lane’s 2 hard hats featured his signature scavenger style, one with a working gas gauge, and the other transforming the hat into a video game console. Hard hats by Lane Shordee. Gas Gauge hat worn by Dale Ens of the Calgary Foundation. Jayda Karsten – artist and former King Edward student – used repurposed materials from a collaborative installation during PHANTOM WING for her first hard hat. In the installation Winged Apocalypse, “wings made out of window blinds represented a Phoenix rising out of the ashes or an angel of a postlapsarian city”. For the hat worn by Reid Henry, cSPACE’s President & CEO, Jayda posed, “If wings on your feet represent being swift footed, do wings on your head represent having your head in the clouds?”. Inspiration for Jayda’s second, balloon-adorned hat came from reused materials from the 2012 Doors Open YYC and celebration of the 100th birthday of the school. Jayda created an installation that engaged the community to fill a room full of balloons – symbolically breathing new life into the building. 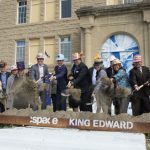 We thank all of the artists who helped make our groundbreaking a very special and memorable event and look forward to providing the arts a place to thrive when we open cSPACE King Edward in a short 18 months. cSPACE partners, shareholders, staff and board wearing their custom hard hats. Thank you from our team to the artists! cSPACE Projects is a social enterprise that supports communities of artists, non-profits and entrepreneurs working at the creative edge of change.